Not too long ago we were posting about Google’s not so new “posts” feature. This subtly released addition is now the topic of many conversations given its ability to utilise more of your company’s search engine results page (SERP). Well, now there’s another tool to help you own the SERP! 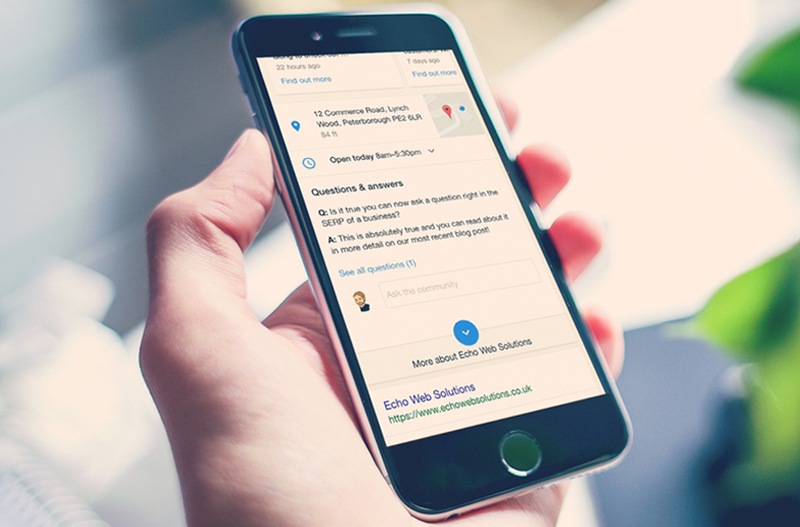 Questions & Answers appears only on mobile devices as it stands, visible inline with Posts & your other business information. It is, however, likely to roll out to all devices imminently so do not be put off by mobile (for many industries most traffic is through mobile anyway). This is a simple concept; an area in your SERP where anyone (even you as your business) can ask a question. The floor is then open for you, your customers or anyone to answer these questions. Google isn’t frowning upon businesses asking questions either so start utilising this platform now. The opportunity for businesses is massive given its such a simple tool. Imagine for example a plumber. A customer might have landed on their SERP after a burst pipe in the middle of the night and wonder if the plumber is likely to answer the phone this late. Questions and Answers give’s that plumber real estate on the SERP to have that question asked and answered with a number ready to call, all from the SERP. Let’s take an example from another industry. One of the most common questions restaurants face as food trends change is “Do you have a vegetarian/vegan menu?”. This information often isn’t visible until you dive into the site and find the menu itself. Now customers interested in visiting establishments can easily ask this question right in the SERP with minimal effort and await a response. Not only does this help that specific customer but any others looking into the restaurant. Name an industry & the likelyhood is there’s a powerful use for Google Questions & Answers in their SERP. Of course with a correctly set up Google My Business account this information may be present anyway, but Questions & Answers means your USP’s can become clearer to customers while taking up even more of your SERP page. This is real estate you want to own. There is no indication as of yet that they have any impact as a ranking factor, but watch this space! You can see an example live on our SERP (mobile only), or if you’re feeling curious you can ask us a question! Coming soon: Next up from Google and currently available to a select few, Video in Google Maps. This allows ‘Local Guides’ to contribute content about your business.